Put together a picture of a developing future before it becomes real or before it has an impact on your business. Getting an accurate view of the business is challenging. Information is stored across multiple, disparate systems and manually based data management processes are time-consuming and error-prone. Working closely with the customer, our engineers integrate and map all of the relevant source data—regardless of type or volume—into a single, coherent model. Develop a central operating system to organize all of your data, and use powerful algorithms to automate the data capture and processing process so that you can liberate resources to do more proactive work. StakeWare takes your business beyond traditional software by streamlining operations across your entire organization and providing you with the real-time visibility you need to make better, faster decisions. StakeWare streamlines the complete issue lifecycle, enabling companies to form new insights into the interactions between the interest of the stakeholders and the impacts on the company. Moreover, having a complete view of your stakeholders, including activity history, key contacts, interactions, internal discussions and insights from popular social media sites such as Facebook, Twitter, LinkedIn, and YouTube — right within StakeWare can help you get ahead of the next problem. 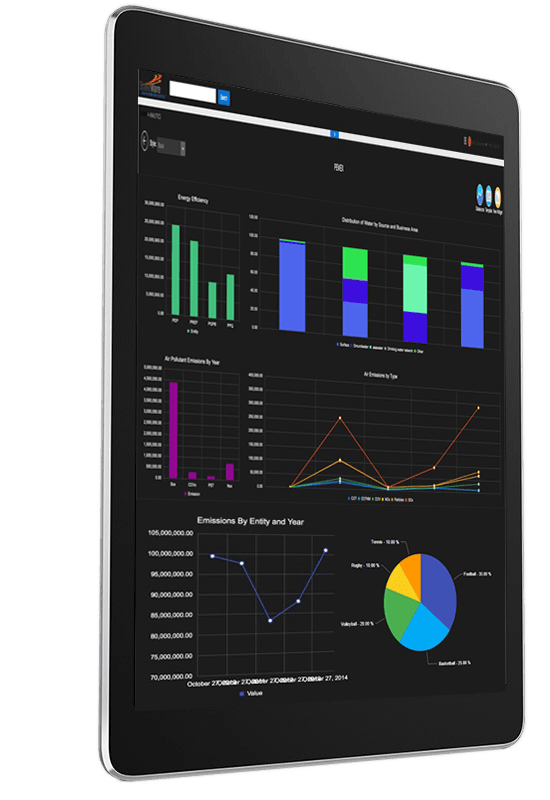 StakeWare Business Intelligence provides the power of built-in, real-time dashboards, reporting and analysis across all the integrated processes within the software suite. Realizing true value-added insights, business users gain real-time visibility to identify issues, risks and opportunities and instantly drill down to the underlying stakeholder to take action. Precision issue management for everyone: Deepen stakeholder understanding with real-time digital analytics and reporting that can be shared across the business. Identify risks and opportunities before your key stakeholders can so you can act quickly in order to seize the opportunity or to avert risk before impacts become relevant to operations and your reputation. Leverage the issue management process to improve team collaboration. A highly collaborative communications process can help a lather large and complex global company gather and report intelligence on issue risk and opportunity in a timely, consistent and strategically relevant manner. Identify issues as early in their life-cycles as possible, before they cross the “public threshold”. By sharing intelligence collaboratively you can capture a pattern or dissimilarity early in an issues’s lifecycle, more fully analyze the inherent risk or opportunity and prepare issue managers and company decision-makers for actions that may be required. Crawl the web to find useful information that can be indexed according to your own knowledge framework. Use that information to understand fluctuations in the issue life cycle as well as to anticipate potential risks and opportunities. 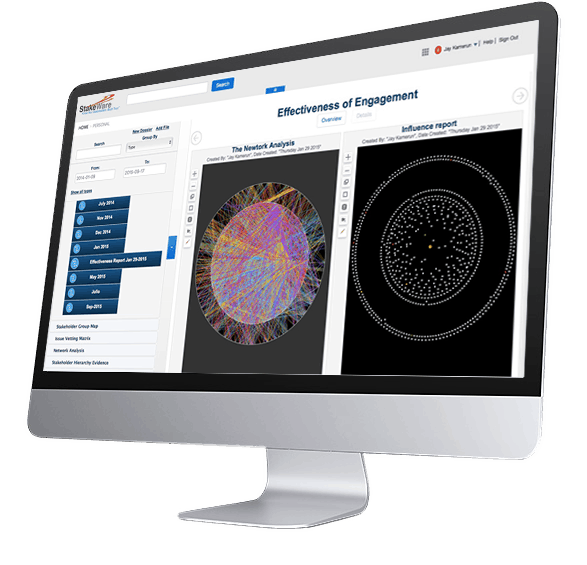 StakeWare brings abstractions to life in the form of rich visualizations. 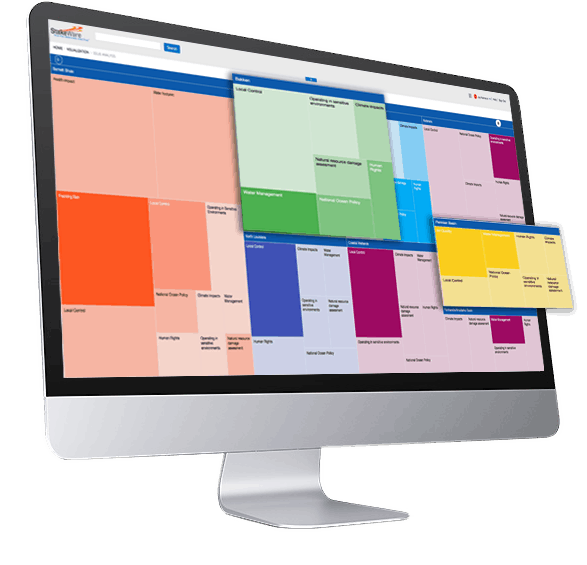 Tables, scatter plots, and charts interact seamlessly to provide a holistic view of all integrated data of interest. The visualizations update in real-time with the source data, so users always see the most accurate and current information at any given time. The world has become a “noisy” place. Predictive Intelligence gives decision-makers the power of data science to understand each stakeholder’s preferences and intent to automatically optimize every interaction, in any channel, across the stakeholder journey. Harness social conversations to listen, analyze, publish, and engage with your stakeholders, on a 1-to-1 basis. Listen and analyze social media conversations to discover the most influential stakeholders on a given issue. Drive more conversions, win loyal advocates, and cut through the noise every step of the way. Build more meaningful relationships with stakeholders by tapping into the power of social media to monitor the lifecycle of an issue. Generate predictive scores about stakeholder engagement likelihood. Infer stakeholder preferences and discover key behaviors. 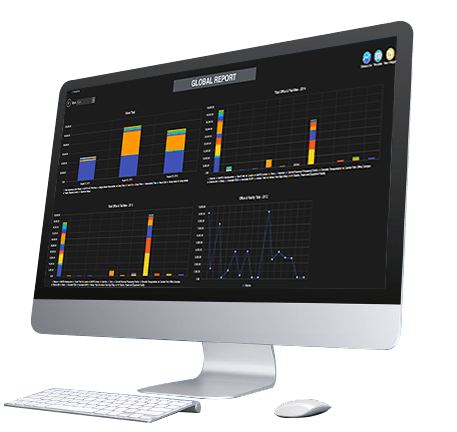 StakeWare provides real-time visibility across your entire enterprise, enabling unprecedented access to stakeholder, sustainability and business data worldwide. StakeWare gives you visibility into every aspect of your multinational organization, even with multiple languages and cultural differences — including a trust index by issue. Unprecedented Worldwide Visibility into Operations. Role-based dashboards and “drill-down everywhere” provide instant insight across the corporate hierarchy of subsidiaries. StakeWare delivers a real-time, unified global business management platform for enterprises that manage multinational and multi-subsidiary operations—at a fraction of the cost of traditional on-premise Business Intelligence solutions.